Ever since we moved into this place, I’ve been struggling with what to do about the giant wall behind our television. It’s either been blank, or it’s been a hodgepodge of unrelated things that are spaced awkwardly. Thumbs-down. 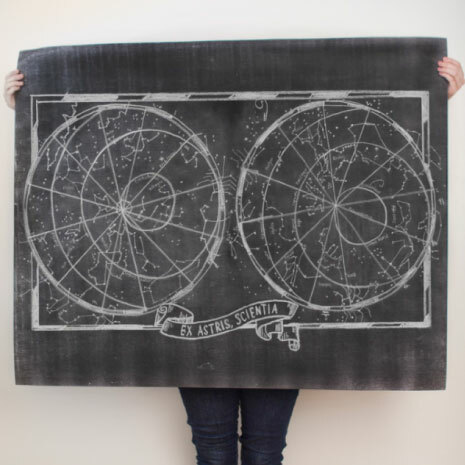 Then today, I stumbled across Caravan and was instantly hooked – I liked their chalk artwork best, and when I saw the “Ex Astris, Scientia” Constellation Print, I immediately thought of the horrible wall behind the TV and placed an order. The cool thing about Caravan is that most of their stuff (if not all of it) is print-it-yourself. They have instructions on how to request 36″x48″ prints on a large-format B&W printer for something like $7, which I managed to do with Staples’s online copy center thing without too much trouble. I have my fingers crossed that Staples prints it correctly; I had to request that they fit it to the paper because the preview didn’t indicate that it would do that automatically. I’m not sure yet how I’ll hang it up; right now I’m thinking something like this, hung from clear push pins. Regardless, I’m excited to finally have SOMETHING interesting on that wall!